Do you have bamboo on your property? Bamboo is a type of grass with a hard, hollow, woody stem. It is a perennial evergreen, which means it grows every year and stays green year round. The irony of bamboo is, that while beautiful and often times tranquil to look at, having it on your property can prove to be quite the headache. Known as the fastest known growing plant, bamboo can grow up to 5, 10, even 20 feet in just one season. Each year, bamboo multiplies greater than the year before. It can easily start creeping into your neighbor’s yard and get out of control rather quickly. Because of this, many towns on Long Island are passing legislation requiring home and business owners to completely remove this species from their properties. Rather than spreading seeds, bamboo spreads by sending out new shoots. The root system grows outwards from the base, and from time to time sprouts new stalks. These roots can migrate from neighboring properties and sprout through and crack garage floors, driveways, and sidewalks, a hassle that no one wants to deal with. 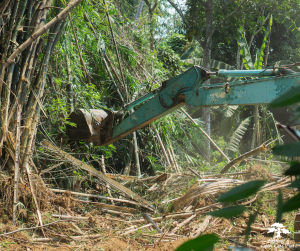 Because a single growth can extend for acres, getting rid of bamboo can prove to be rather difficult and time consuming. Many home and business owners will attempt to remove their bamboo themselves but quickly run into more problems than they anticipated. Properly removing bamboo and its entire root system is labor intensive and something that needs to be done correctly to ensure full eradication. L.I. Elite Lawncare is available to provide you with bamboo removal to take this task off of your shoulders. We provide the peace of mind of knowing that not only will we remove bamboo from your property, but also ensure it does not return. Once the bamboo is removed from your property, we install a bamboo barrier, a plastic border that is 20” deep, so that the bamboo cannot spread back into your yard. L.I. Elite Lawncare is available for bamboo removal for both residential and commercial properties around Long Island. We can get rid this invasive species from your property at a price that won’t overwhelm you. Don’t risk getting fined! Contact us today at (631) 277-1111 to discuss bamboo removal. We’ll get the job done for you professionally and efficiently!